MFI software is designed to work seamlessly with all Micro-Flow Imaging systems. Each application features a user intuitive interface, guided procedures and powerful reporting functionality. Optimized to meet the demanding requirements of the pharmaceutical marketplace, MFI View makes sophisticated particle analysis simple. The MFI View System Software serves as the workhorse MFI application. Designed to perform high-throughput particle classification and achieve results in record time, this robust tool simplifies the whole analysis process. Instantly classify particles like protein aggregates in large groups of samples, create automated protocols in 5 minutes, and do it all with full 21 CFR Part 11 security. 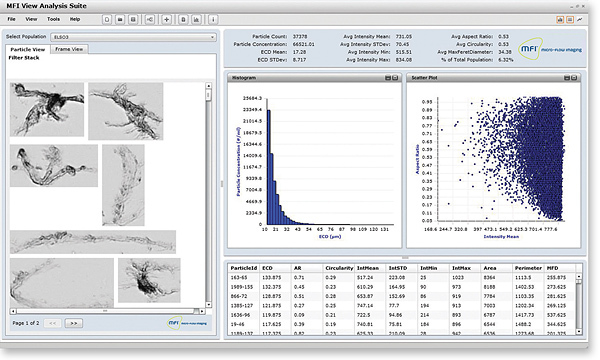 The MFI View Analysis Suite is an independent software package for image-based particle classification which complements the MFI View System Software. 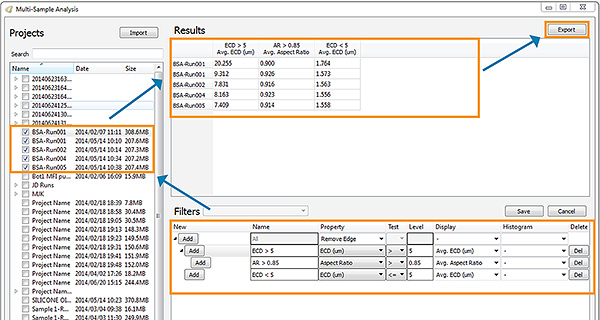 Its sophisticated yet user-friendly interface will allow users to easily gain new insight into their particle populations.